Some libraries will post your review immediately while other libraries may want to review your submission. A message will display after you submit your review advising whether an approval is necessary. Search for the title you want to review. After your search results display, click the title you want to review to display the title details. Click Reviews. 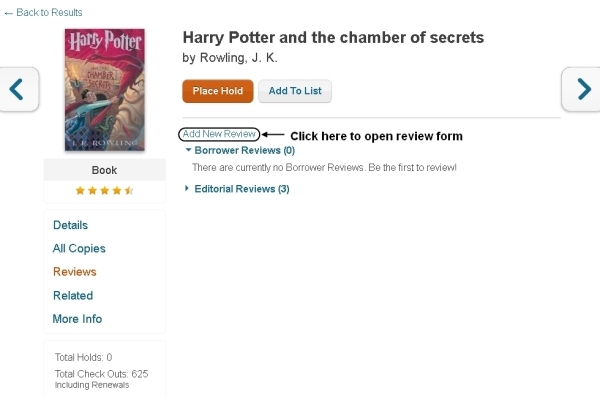 If any borrower reviews have already been written for the title, the reviews will display under the Borrower Reviews heading. Refer to the example below. Click Add New Review. The Add New Review form displays. 1 = Bad, 2 = Poor, 3 = Average, 4 = Good, 5 = Awesome. Title of Your Review *: Type the title of the review you are going to write. You are allotted up to 40 characters. This is NOT the same as the title of the book, but your own creation. Your Name (optional): Type your name or the name you want to use as the reviewer of the item. This is not a required field. Write Your Review *: In the entry box, type your review. You are allotted up to 10,000 characters. Note: In order to successfully submit your review all * (required) fields must be completed. Failure to enter information in any of the three required areas will result in an error message requesting the missing. Focus your review on the item. Describe your personal experience on whether you liked or disliked the item and why. Provide other readers with a taste of the plot, but do not give away surprises, especially the ending of the story. Do not use offensive language or profanity. Do not add contact information. After you have completed your review click the Submit button to post your review. After you click Submit, a green banner displays at the top of the screen, Thank you for submitting a review. Refresh the screen to see your review. Reviews are sorted by a timestamp; therefore, newly submitted reviews will appear at the top of the list of reviews. If a message displays advising, Thank you for submitting a review. Your review will be posted upon approval of library staff. then your review will post once it is reviewed. You will not receive a notice when the review is actually posted. If you change your mind about posting your review, click the Cancel button. However, once you click Submit you cannot delete or edit your review. If you have just rated a title, a Would you like to write a review? link displays. Click the link if you want to write a review. You will be asked to log in with your library credentials if you aren't already logged in. The Add New Review dialog opens. Your rating will be displayed. Complete the form as described above in Add a Review from Reviews Option Steps 5 and 6.